Among the variety of scopes on the market today, the 1-4x magnification range is one of the most popular choices of many hunters and sport-shooters. Almost every manufacturer makes a scope in this specification and the prices can range from affordable to the very high end. Finding the best 1-4x scope can be difficult with an endless array of options, but here are five excellent choices to consider when shopping for one. Why Is 1-4x So Popular? This particular type of scope can offer the best of both worlds between accuracy and affordability. Couple that with being versatile across numerous different firearm models and the ability for newcomers to quickly acclimate to using a scope and you’ll understand why the 1-4x usually fits the bill. If you’re just beginning your search for a scope or looking to build out your collection, a model in the 1-4x range provides a great starting point or provides a great all-around tool for a variety of shooting situations. In total, a 1-4x scope provides a great level of value for a reasonable cost, something that can last for years and be usable time and time again on many different guns. In general, a 1-4x scope is used for short range shooting, usually dialed-in for “zero” at 100 yards. Depending on target size, it can be useful up to 300 yards out but with a maximum magnification of 4x, you won’t go much past 300 and still expect dead-on accuracy. The 1-4x is designed for short range point and shoot applications. Consider small game hunting where targets appear without warning. Having a scope that helps you draw quickly on the target is key in these circumstances. It is also good for tactical use since these situations almost always involve close range contact. If you’re looking for a home defense scope, the 1-4x can be useful. In the role of self-defense or home defense, you can zero it in for 50 yards and cover almost any scenario. If you want to work on your accuracy, the 1-4x is a great option for novice shooters wishing to improve their skills. Whether it’s learning to acquire your target quickly or just getting used to working with a scope, the 1-4x is an inviting option to start with. With a good 1-4x scope, you get magnification in a simple-to-use package without many of the bells and whistles of a high-powered scope. For beginners just getting started, there is no need to buy the biggest, most expensive option until you’ve mastered the basics first. Learning on a low-powered 1-4x scope is much more forgiving than trying to start out hitting targets at 350 yards with a high powered option. Take the time to master the short range shots, learning how to adjust for windage and elevation. Mastering these bedrock skills will help you know when you’re ready to move up to more challenging distances and shop for more advanced scopes. With so many options on the market, deciding that you’re ready to shop for a 1-4x scope is only the beginning. Here are some ways to compare products and figure out which one matches your budget and personal preferences. When you’re shopping for a 1-4x scope, you’re not usually looking for a lengthy list of high-end features. Typically you’re looking for a good all-around option that will last you years and provide good results over time. This is where built quality comes in. If you can examine a scope in a retail store, judge how it feels in your hand. Do the knobs feel cheap? Do they turn well and provide defined feedback for each click of adjustment? Does the focus perform well, is it usable when quickly changing target distances? Does the body of the scope feel rugged enough to take an accidental drop or get bumped being taken out of the truck now and then? Answering these questions can help you get a feel for how well the scope will hold up over time. A cheaply made product simply won’t last considering the conditions in which it is meant to operate. You’ll want to look for lifetime manufacturer warranties along this line as well. Apart from overall quality, the reticle is very important since you’ll be staring at it and using it for every single shot. Reticle choice is highly dependent on your intended application, though most any style will do if you’re just looking for an all-around option and don’t’ have a specific use in mind. However, let’s examine a few use-cases to help you get an understanding of what to look for. Reticles come in varying styles and sizes, most of these differences depend on your target distance and/or experience level. Since a 1-4x scope is typically used for short-range shooting, features like bullet drop compensator (BDC) indicators are less important than scopes used for long range shooting. For home defense or tactical situations, you may consider an illuminated reticle. In this case, the style or shape is less important than making sure the reticle is visible in low-light environments. This is good for situations where the reticle will stand out and be easily acquired by your eye. It may also help for hunting conditions when mother nature turns down the lights. Since 1-4x scopes are used for short-range point and shoot applications, you’ll want a scope that allows for generous eye relief. In many instances, you won’t have time to sit and line up your shot, you’ll be looking for quick target acquisition followed by pulling the trigger. This can be true in hunting and tactical situations. You’ll want to look for eye relief of at least 3 inches, perhaps, even more, depending on your model of gun and how you plan to use it. Now that you know what to look for, and what to expect from a 1-4x scope, here are some options to consider along with feedback from users on how well they live up to expectations. Vortex Optics is fairly new to the scene, established in 2004, but they have a reputation for producing phenomenal scopes for hunters and shooting enthusiasts. This 1-4x offering from the popular Crossfire II line is no exception as it provides lasting durability at a moderate price. With an eye relief measurement of 4 inches, it is a great candidate in this magnification range for comfort and ease of use. It also features an illuminated red dot in the center of the reticle to provide for quick identification during low-light situations. Think of the red dot at the cross-hairs to be a compromise between a fully illuminated reticle and no illumination. Along with the generous eye relief, the Crossfire II also features a fast focus eyepiece for quickly adjusting to your target distance. This is especially useful at shorter range shooting where differences of 15 or 20 yards, for example, need to be accounted for when acquiring the target. It sports the industry standard O-ring sealed housing for weatherproofing and a nitrogen purged interior to hold up against fogging. This makes it a great option for outdoor use in harsh conditions. It has been called the culmination of price and quality by some users who feel that the illuminated red dot makes it stand out for use in low light conditions. The Bushnell Optics FFP 1-4x 24mm will set you back a little more than the Vortex offering, but you will walk away with more features typically only found on higher end scopes. Featuring a fully illuminated reticle with bullet drop compensation, this scope packs a serious punch. Bushnell claims it is accurate to 500 yards which is far and above what most 1-4x scopes will be used for in shorter range shooting. To emphasize this point for achieving long-range results, this scope includes Bushnell’s exclusive Throw Down PCL feature. PCL stands for Power Change Lever and this feature allows for instant adjustment of the magnification between short and long-range meaning it’s great for shooting competitions or situations where target distance can change rapidly. It also features a first focal plane reticle with 11 settings and touts low-light operation as a major selling point thanks in addition to the full illumination. All these features, however, do not come without a price. 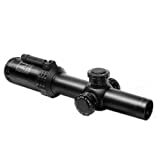 In this case, the drawback is added weight as this scope is over 1 pound sitting at 17.3 ounces. It’s heavy, but the features may be worth it if you need illumination and options like the Throw Back PCL. The CenterPoint brand is at the lower end of the price spectrum, but that doesn’t mean you’re getting a low-quality product. 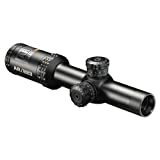 The “MSR” in the title stands for modern sporting rifle since this scope is specifically geared toward the AR platform. Among the short list of features, this scope comes with built-in offset Picatinny rail mount support and sports extra-long eye relief. It also features an illuminated dot in the center of the reticle crosshairs which can be set to show as red or green. When illumination is not in use, the dot shows as black. Most users agree that for the price point, this is an excellent scope. It has some features you wouldn’t expect to find in a lower-end model, such as the illuminated dot and the built-in rail support, and also seems to have a durable construction. Users also applaud this scope’s accuracy which seems to hold tight groupings from distances around 100 yards. This model is not meant for long-range shooting, but it could be a great option to get you started with a decent scope at a very affordable price. Here’s another entry on our list from Bushnell Optics, this model designed specifically for the AR platform. This scope features several of Bushnell’s popular features including the BDC Ballistic Reticle which is calibrated for 55-62 grain, 223 REM/5.556 loads with aiming points out to a whopping 500 yards. Once again Bushnell aims high, if you will, with their claims, and they bring the reputation to back it up. Also featuring fully-coated optics for maximum light transmission and a fast focus eyepiece for quick adjustments on the fly, this scope is made for adapting to changing situations on the fly. Users often remark how accurate it shoots right out of the box with minimal adjustment, this can be a good option if you want to start using it with factory settings and adjust incrementally from there. It also receives high marks for image clarity as well as a clearly visible reticle. At just under 17 ounces, it’s a little on the heavier side, but some of that can be attributed to superior build quality, a staple of most Bushnell products. One area where it lacks slightly is the eye relief which sits at 3.5 inches. This is below some of the other options on the list which make it to 4 inches. It also comes with the Bushnell lifetime warranty as well as the standard sealed O-ring body for weatherproofing and the nitrogen purged interior for fogproof operation. Monstrum Tactical is a new player in the scope market founded in 2008. Despite their newcomer status, compared to some of the big names, they have started making a real reputation for themselves with quality scopes enjoyed by hunters and enthusiasts alike. This model features an illuminated BDC reticle, in red or green with varying levels of brightness, that is designed for higher visibility in low-light environments. It also features an aircraft-grade aluminum construction, an industry standard for most quality scopes, and is backed by a one-year warranty. As far as image acquisition, this scope features a first focal plane range finder reticle which allows for quicker target distance estimation and provides maximum functionality for most shooting conditions. This configuration will function well for short to mid-range tactical situations which is the application it is designed for. Some users report that the image quality exceeds higher priced scopes which makes this an impressive mid-range option. Users also report the field of view is very generous at varying target distances and the eye relief is designed for comfort. Related Read: How to use a rangefinder reticle. Does an illuminated reticle hinder daytime performance? – Some users may wonder if the addition of illumination to the reticle would cause any effect on the scope when the reticle is turned off. In most instances, the reticle simply appears a very visible black when the illumination is not in use which means it should simply function as a scope without illumination when the feature is not turned on. Is 1st or 2nd Focal Plane (FFP or SFP) important to consider? – For most 1-4x scopes, 1st focal plane (FFP) is the best option for short to mid-range shooting. 2nd focal plane (SFP) scopes are typically reserved for long-range shooting. With 1st focal plane, the crosshairs become larger as the magnification is increased, while 2nd focal plane will show the crosshairs as the same thickness regardless of magnification level. You will rarely encounter a short-distance scope configured with an SFP reticle. Do I need anything extra to mount a scope? – In some cases, a scope will come with the needed mounting rings to attach the scope to your weapon of choice for an average configuration. In many cases, however, it will be up to you to find the mounting hardware needed since it can vary by platform and some scope manufacturers don’t include these accessories. Adding a 1-4x scope to your rifle or shotgun is a great addition that will enhance your accuracy and increase enjoyment of shooting. This particular configuration offers a good all-around solution for short range and medium range shooting, covering applications in hunting and self-defense. Thanks to the versatility of a 1-4x, you will most certainly find a use for it. There are many things to consider when choosing the best 1-4x scope, such as durability, features, warranty and overall sentiment from user reviews, and hopefully, this guide has left you with ways to evaluate your options and make an informed decision. If you enjoyed this article please check out some of our other content like how to use open sights or our tutorial on sighting in a pellet gun scope.